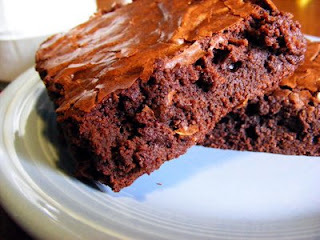 This recipe is so moist and chewy you will be amazed that it is so simple to make. That is if you don't mind using a double boiler. I like to double this and make half with nuts and half without. It really doubles easily, so make a bunch, they will not last long. Melt butter, chocolate, and sugar together in a double boiler. Once chocolate and butter melt and sugar is mixed well remove from heat and add the rest of the ingredients. Don't over mix, pour into a 8 inch baking pan and bake a t 350' for 45 minutes. These are really good with vanilla ice-cream, note to self buy more vanilla ice-cream. That is What's Cookin today on Beaty's Creek. Mmm--yummy! Will have to try these too!